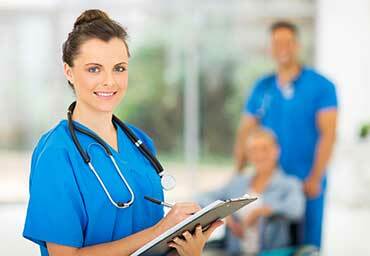 Start A Career As A Medical Assistant in less than 10 months! As the business of healthcare evolves, the need for Medical Assistants continues to grow. Southern California Health Institute’s Medical Assistant Program prepares the student to practice safely and skillfully in a variety of medical environments. Topics covered include anatomy, physiology, and medical terminology. Competency in administrative and clinical tasks is emphasized with a focus on soft skills and professionalism. Career development and job preparation are also covered. A full lab is available for all the practical components of the courses to prepare the student for working in the medical setting. As a capstone to the program, students complete 150 hours of externship. Student and Professional Membership in the California Medical Assistants Association (CCMA) are provided.Upon successful completion of the program, graduates will be prepared for employment as entry-level Medical Assistants and will be eligible to sit for a certification exam through the National Healthcareers Association as Certified Clinical Medical Assistant(CCMA). Medical Assistants are an important part of the health care team and their responsibilities continue to expand. The Medical Assistant program at Southern California Health Institute is designed to provide students with the knowledge and skills necessary as an entry level team member in a medical office, clinic, or other health care setting. A foundation in the basic medical language as well as the structure and function of the human body is provided. The program focuses on helping students develop competency in the areas of administrative and clinical procedures, preparing patients for examinations, back-office clinical procedures, administration of medications, and routine laboratory procedures. Additionally, the program provides the student with the soft skills and professionalism necessary to function as a member of the medical team in an efficient clinical setting. Topics in professional development and career preparation are also explored throughout the program. Upon successful completion of the classroom and laboratory training, students are required to complete 150 hours of externship. Students will receive a membership in the California Medical Assistants Association (CMAA). Upon successful completion of the program, graduates will be prepared for employment as entry-level Medical Assistants and will be eligible to sit for a certification exam through the National Healthcareers Association as a Certified Clinical Medical Assistant(CCMA). NHA empowers people to access a better future through certification exams, preparation materials and study guides. They are passionately committed to developing, advancing and advocating for the frontline healthcare worker, resulting in improved patient care. Recognizing that the scope of practice for the medical assisting profession is always evolving, NHA, with the help of numerous subject matter experts, recently conducted a nationwide Job Analysis to ensure that our exam tests the most current and relevant competencies necessary to ensure proficiency in the profession with the CCMA certification exam. Certified Clinical Medical Assistants (CCMAs) are a vital part of clinical patient care. Because CCMAs are trained to perform so many different tasks, they are in great demand in the workforce. Why you choose our school? SOCHi chose to partner with Pearson, a trusted provider of educational tools for many decades, as its source for the development and delivery of a comprehensive Medical AssistantProgram that meets the needs of the local community in preparation for the workforce. Additionally, feedback from medical professionals and experienced medical assistant instructors was solicited and used to create the ideal learning experience for the student. The Medical Assistant program is designed with a combination of informational and practical learning experiences to prepare students with the necessary knowledge, skills and competencies required for a career as a Medical Assistant in a variety of clinical settings. Hands-on lab activities and experiential learning through externship give the student confidence to be successful upon entering the workforce. SOCHi reviewed the job outlook for Medical Assistants by using the onetonline.org to find that the prospect of job growth is faster than average, with an expected growth of 14% or higher through the year 2024.